In life, we come across people who inspire, motivate, and encourage us to reach potential that we sometimes don’t see in ourselves. These individuals are good at pointing us in the right direction in life and encourage us to better ourselves daily. I was blessed to encounter several of these people in life. I’m glad and proud to have interviewed an individual who played that role in my life, my high school college advisor, Hector Gonzalez. Hector has inspired me and others to go after our dreams and reach our full potential. 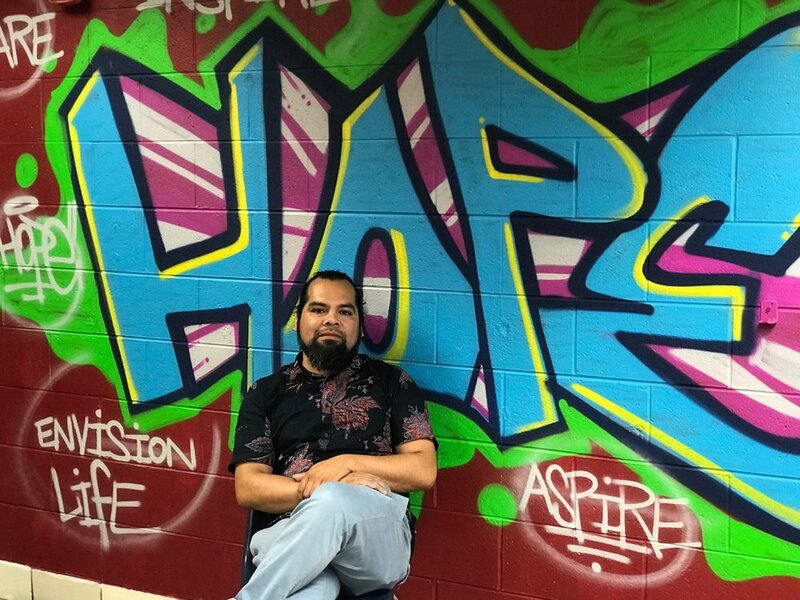 Recently, I was able to sit down with Hector to find out what inspired and shaped him to help students like he once helped me. Hector works for the City Colleges of Chicago. He is what they call a Post-Secondary Navigator. It's a new position that started in 2018 to help CPS bridge the gap with college and career enrollment for a plan called Learn Plan Succeed, which is to be implemented in every high school by the year 2020. In his position, Hector works at three Southside high schools: Hubbard, Kennedy, and Bogan. Hector’s role as a post-secondary coach is working with seniors, specifically seniors that have anywhere between a 2.0 to a 2.9 GPA, and even those with below a 2.0, to help them have a career path after high school. Whether that means they enroll in community college, or university, or workforce, or trade programs, or certificate programs, they have to have a plan. Roughly, within those three schools, he is working with a little over 100 to 150 students. I was born and raised in Chicago. My parents migrated from Mexico to Uptown. I spent a good portion of my childhood in Uptown, where I developed a lot of unique skills. But I feel that some of my finest memories were just living in Uptown. It felt so much more of a community, just because everybody lived in an apartment complex and we all got along together. So it was a really good way to experience life as a young child. From there, we ended up going to Albany Park, which is one of the most diverse neighborhoods in the city of Chicago. I went to public schools and graduated from Roosevelt High School. It was really cool being able to shift between different cultures and just different people in general. Definitely opened up my eyes a lot more in high school, because even that high school was very diverse. Roosevelt was the place where my street education started along with the love of Hip Hip. By chance someone mentioned an AmeriCorps program called City Year, I took a big chance and applied last minute. Upon completion of my service the gave you money to go to school. I used that money to go to Harold Washington, where I got my associates. I was actually the first student at Harold Washington to graduate with an Associates in Latin American Latino Studies, which was something I'm super proud of because I didn't think that was an Associates to begin with. I also have to thank my professor Tapanes-Hinojosa who guided me through my years at Harold Washington College. I then transferred over to UIC where I got my B.A in Latin American Latino Studies. I'm currently pursuing my M.A at Loyola in Cultural Educational Policy Studies. I'm in the thesis process, so I’m almost there. I think what makes all this unique is that I am working with students who remind me of myself when I was in high school. I didn't have the traditional route to go to college right after high school. I graduated high school with at least a 1.0 GPA, got a13 on my ACT, but I didn't allow that to be an obstacle. Why? Because I knew deep down inside, regardless of all the stuff that I've done, that I always wanted to learn. I didn't graduate with my Associates until I was around 25 years old. So, no matter what, I was always the oldest in a lot of my classes. But my path was very different. Sharing that experience with my students means a lot. It lets them know that it doesn't matter how long it takes as long as you finish. What are some other challenges you faced in your career? A lot of it had to do with schooling and not seeing teachers that looked like me. I got turned off from high school early on just because no one in the high school looked like me. Even though we were living in one of the most diverse neighborhoods with extremely diverse students, the teaching staff wasn't diverse at all. It's like Latinos never existed in high school. In our history classes and even including in middle school we never talked about the wonderful things that Latinos have done in the United States and around the world. We have to remember that Mexico was the United States. But we weren't learning any of that history. I really got turned away from education at that point and then really took it upon myself to start reading and learning everything that I possibly could to know my history and my current struggle. I interviewed my parents just to get an idea of where they came from, important leaders in their neighborhood, in their town, and in Mexico in general. The struggle for me was really trying to fit in, trying to fit in not just culturally but educationally. I know us Latinos have had more impact than just coming here illegally or what not. We've done a lot more to make our mark in the United States, and so not knowing that history really pained me. Can you imagine how much more empowering it would have been in class to learn from someone that looks like you or even learn the accomplishments that we've all made? Aside from all these challenges what would you say are some of your greatest or proudest accomplishments and achievements? I would say finishing school. It's something simple. I always count my blessings. I don’t take the privilege that I have of being able to go to school for granted. Outside of family, what brings me hope is young people like yourself. Young people that I've worked with who are doing bigger and better things. Sending students to college, seeing them graduate from stage is a great accomplishment. Not only seeing them graduate but seeing them pursuing a different career or sticking with the path that they want to create. It's not about constantly going to colleges, it's just seeing their successes every single day, every single year, seeing them smile, and being happy with the work that they're doing. It's something simple, but it's hopeful. For me those are the greatest accomplishments because If I decided to not do what I do because I “didn’t fit in”, I would have gone down a business route or working a regular 9 to 5 in a suit and tie. Honestly, I don't think I'd be as happy as I am now. I think it's the fact of giving back that really is empowering for myself and seeing other people shine. I think that it's a blessing because when I think about the mentors that I've had in my past I can definitely say that they made an impact. So, I just want to continue to pay it forward. The successes are really in people like yourself. How does diversity and inclusion play a role in the work that you are doing? I have to remember that most students that we do send away to college, end up going to predominantly white institutions. So regardless, they are always going to be the outsider. When we talk about equity, it's not fair. It's not there. How do we help our young people understand what that means and what their role is in that institution? How do we teach them to fight for equity and inclusion? It's by showing them examples and helping them understand what that really means. BONUS QUESTION- Who would you say are some people that you admire and look up to? For sure my parents. If it wasn't for them obviously, I wouldn't be here. They have always been accepting in the work that I do. I love graffiti, I love hip-hop, I love break dancing. The hip-hop culture is what really influenced and raised me throughout my youth. For them to say, “I get what you're doing fully support it,” meant a lot. My parents, no matter what, have always had my back. They never really understood exactly what I do, but they understand that it makes me happy. I admire many authors because they have opened my eyes to a whole new world. One of my big influences as far as reading and learning and wanting to read more— Eduardo Galeano, may he rest in peace. He's a wonderful author, writer, journalist. One of his books that really influenced me in my youth is ‘Open Veins in Latin America’. It's an amazing book about the history of Latin America. How U.S. imperialism pretty much tore it upside down and how we've taken a lot of things for granted and how we can make a difference. I definitely have a lot of respect for him. I was blessed to meet him several years ago before his passing. He's been a big influence in my life. Another one I also have to give it up to is Luis Rodriguez, who wrote the book ‘Always Running’. I had a chance to chat with him a lot. Him and another mentor of mine Rico, we've known each other since I was a sophomore in high school, and I think it was those two gentlemen that really helped me stay on this path. I was a hoodlum, but they taught me to at least be a smart hoodlum. Those two men have definitely helped me and mentored me in my youth and continue to have my back. For everything that I enjoy doing, I always had to give respect to those people who have influenced me. Whether it's academia, reading, the Hip-Hop culture, or when it comes to thinking about my days being bad, those people have always been there for me and they've never turned their backs on me. I think that's why I want to constantly give back. Our young people are there and they need support. I want to make sure they are making conscious decisions so they can be successful, like those that have helped shaped and guiding me through my life. Reach out to Hector Gonzalez here. To find out how Holistic can help students and graduates, click here.